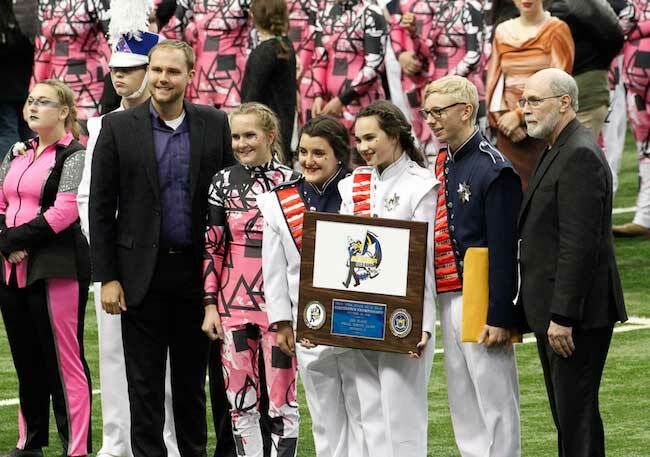 SYRACUSE – Leaders of the Medina Mustang Band accept the second place award in the Small Schools 1 Division on Sunday during the New York State Field Band Conference Championship at the Carrier Dome in Syracuse. Medina competed in the 45th annual championship. This was Medina’s 42nd appearance. There were 53 schools in the conference coming from New York, Pennsylvania and New Jersey. No matter what the scores, all of the bands and their students are winners. Congratulations to the schools that offer and support this art form to the students. The day started off at 8 a.m. with the Dome breakfast put on by the boosters for the students and their families as a form of pep rally. In SS1 Medina competed against seven other schools and came in second place with a score of 90.25, bested by Malverne of Long Island with a score of 91.65. First place scores in the other classes were SS3 – Jordan Elbridge with 75.50; SS2 – Mineola with 85.05; LS3 – Rome Free Academy with 83.25; LS2 – Jamestown with 89.90 and National – Arlington with 95. Before the group headed to the Carrier Dome, Medina director Jim Steele commented that the best feeling is going on the field, loving and caring for all the people around you. One band, one sound, enjoying the journey together as one, Steel said. Regardless of placement these kids are great ambassadors for our school and our community. A heartfelt thanks goes out to Superintendent Mark Kruzynski and Mike Cavanagh, the high school principal, for attending the show along with the many parents and fans.